Dolores Travel - Uzbekistan & Central Asia Private and Group Tours 2019! Best Incoming TourOperator 2015 to Uzbekistan! You would be able to construct your own unique tour to the cities of Uzbekistan. Our professional tour operator will help you to realize the rout. 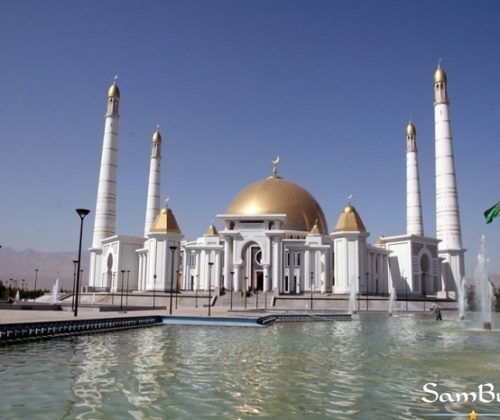 7 DAY TOUR OF UZBEKISTAN: TASHKENT, SAMARKAND, BUKHARA AND MOUNTAINS! 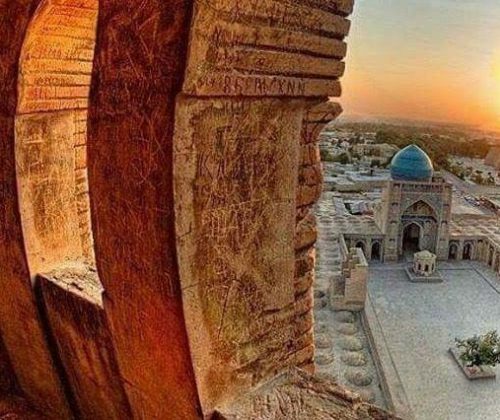 GUARANTEE DEPARTURES DATES Pearls of Uzbekistan 2019 6 DAYS! Would you like to experience some unusual oriental atmosphere? Uzbekistan can probably be an interesting destination for your trip. This Asian country will most likely give you a bunch of new unforgettable impressions. Visiting this fairytale place, you will easily feel that you are in one of the “One Thousand and One Nights” stories – this is certainly something that only rare places can give you. If you get a touch from the Uzbekistan culture for the first time, you will definitely be amazed by the country’s traditions and customs that go deeply into history as well as surprised by people’s hospitality. You will also be fascinated by the nature – its beauty surrounding you everywhere won’t leave you cold. For foodies who would like to enjoy the famous oriental cuisine, Uzbekistan definitely has a lot to offer too. If you put this fabulous country on the top of your places-to-visit list – you will never regret for sure! And here is exactly why. Uzbekistan natural resources are rather unique in comparison to other Asian countries. And you will probably be deeply impressed by the variety of landscapes. Here, you will find both mountains and deserts, rivers and caves – a lot of spectacular places that can catch the eye of an experienced tourist. Oh, and don’t forget about national parks – a nature lover will be totally satisfied. 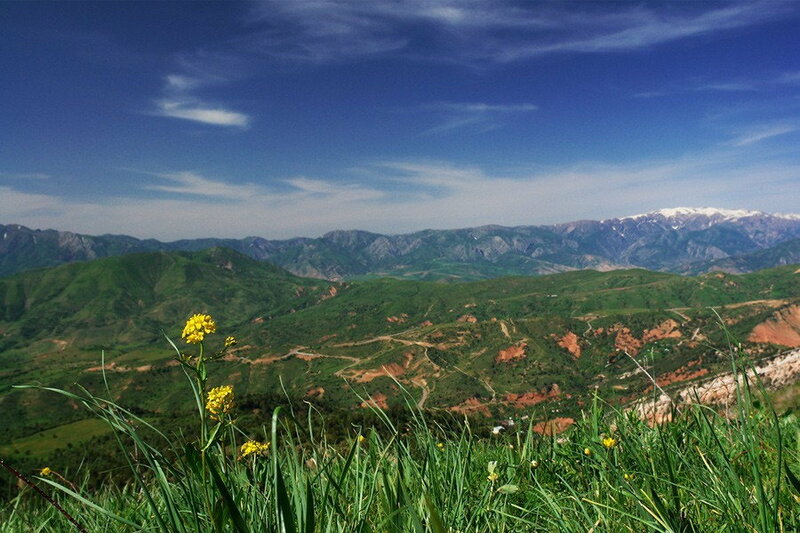 One of the most remarkable things about Uzbekistan nature is mountains. 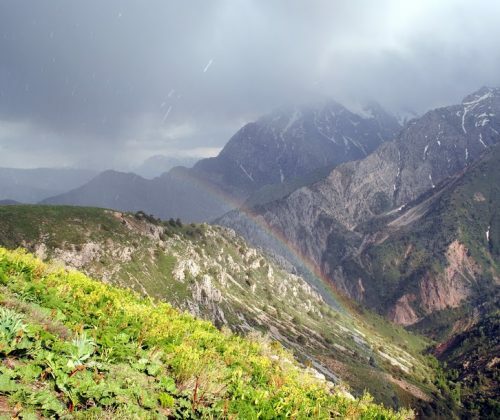 Spectacular mountain peaks sometimes reach up to 4600 m. Overall, the mountains take about 20% of the land of Uzbekistan, and some of the most beautiful national parks are situated there. white sands of the Aralkum. The weather is wonderful about 300 days a year due to the country’s geographical location. But if you want to take the most of your trip, visiting Uzbekistan during the mild seasons, which is autumn and spring, is recommended. Many of the former Soviet countries will hardly impress you with their architecture. But this is a wonderful exception! Each Uzbekistan city that belong to the top 20 biggest ones will let you feel a special atmosphere of the East, carefully preserved since the ancient times. The cities with their high walls, minarets, blue domes, and palaces will remind you either of oriental fairytales or of good old Disney cartoons. 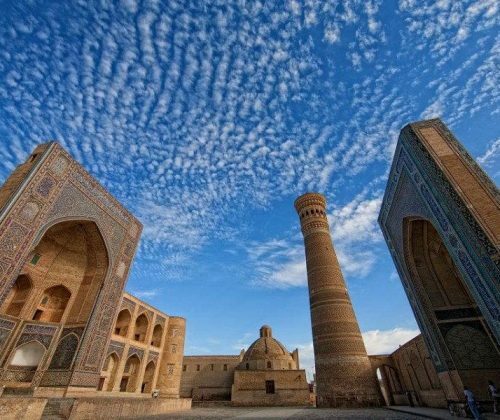 Such cities as Bukhara, Itchan Kala, Samarkand, and Shahrisabz were even included on the Word Heritage List, which once again proves that they are more than worth visiting. This country can impress every visitor by its national traditions that date back to some important milestones in the Uzbekistan history. You will be fascinated by local music and dances, art masterpieces, authentic clothes, and delicious cuisine. You should also keep in mind that Uzbeks are the nation that has a deep respect to traditions and customs. An old custom to give a hearty welcome to strangers emerged back in the times when the Silk Road passed through the country. This is how one of the most remarkable national features, which is hospitality, has appeared. If you prefer to be greeted with a decent meal, this is the right place! You will have a chance to try the most diverse cuisine of the East. Every gourmet will find something unusual and delicious to his or her taste. If you come from Europe or the USA, Uzbekistan will probably look very different from what you have seen before. However, it doesn’t mean this country isn’t worth to be explored. You can learn a little more about it if you search for “Uzbekistan facts” on the Web. Yet, this will be an easy but rather boring way. A more exciting one will be to visit Uzbekistan, dive into its atmosphere, and experience everything on your own. Uzbekistan during tourism seasons reminds Babylon – it is a pandemonium of languages and cultures. Still, Russian speaking tourists are dearer and closer to our hearts than tourists from the rest of the world. We should thank Russian language for that which within 70 years in Central Asia became Esperanto – Russians, Kyrgyz, Tajiks, Uzbeks, Kazakhs, Turkmens use it for communication. Unlike Arabic language, which once used to be commonly used all over the East, Russian language did not suppress national languages but gained national notes itself yet at the same time kept its purity. Foreigner in Uzbekistan can be helped, suggested, fed but usually it is impossible to fulfill a wish of “Talking about life” – it is one of the most outstanding features of Uzbekistan people – a philosophical talk while drinking a cup of green tea. No matter from which Russian city the guest comes from, his Uzbekistani interlocutor has a brother, father of the son-in-law, or friend’s son there or he used to visit the city himself or served in the army there. Many Russians come to Uzbekistan answering the call of the nostalgia. They come here and touch the changed city perplexedly – where is old Alayskiy? Where are the wooden gates of Gospitalka? Here a Jewish shoemaker used to sit, and there, in front of the fountain, used to be a small shop. Tashkent welcomes them with urban landscape in which verdure and blue sky dissolved; with numerous foreign cars on wide roads and too clean, in European style, bazaars… Only some time later, when sitting in a small chaykhona on the bank of Akhnor in a company of close people, they make sure that old friends remain the same – the same funny, hospitable, generous – it can only happen that they have become several kilos heavier and inside their newly renovated house inner yards there are Nexias but not VAZes. Those who have never been to Uzbekistan are full of stereotypes. They wonder at seeing short skirts of local beauties, wonder to availability of night clubs and are happy with attractive prices. Later, they will be telling with astonishment how they stopped to make a photo of a house in Bukhara and were called from there, set at the ayvan under the vineyard and were offered to drink a cup of tea. Or how they were bitten by a wasp and a whole crowed gathered around discussing how to help and the scale of the help overcame the level of the problem. Or how they were treated to the apples from the garden and flat bread from the bakery and were not just explained the route but showed and accompanied. They will forget all historical facts and picturesque names told by the guide, but they will always remember the aroma of the melon and the air of this hospitable land. Our hospitality is not ostentatious, it is not for the sake of earning more or be liked. Uzbekistan people need It themselves, it is on genetic level, in blood. Guest is the most longed-for interlocutor. It is interesting to listen to him, to wonder, to smile at his delight. Astonishingly various and ancient culture of Uzbekistan owes its color to combination of many cultures and assimilation of numerous ethnical groups, from China to Europe. The Great Silk Road facilitated fusion of cultures of many nationalities, their traditions and arts. Traditions in different regions of Uzbekistan are not the same – each area and district has its national distinctive features. Due to special characteristic of a piece of art, ornament, piece of cloth or music, the homeland of an interlocutor was identified. Yet all these variety has a single feature – fiddly many-days labour over things or notions. Fine and filigree work done perfectly. 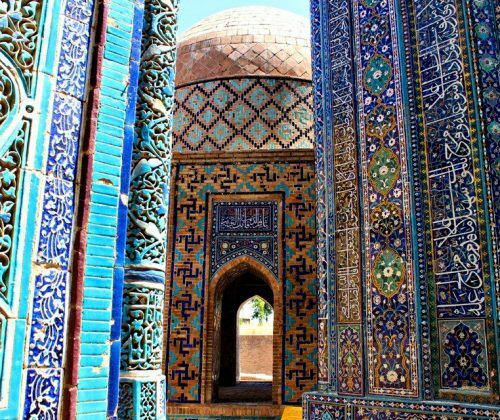 If talking about architecture, Uzbekistan gave the world numerous works which are included into world heritage of UNESCO today. Palaces of rulers, houses of aristocracy and townspeople, mosques, madrassas, mausoleums, summer palaces, khanakas, trade domes, minarets, fortresses are the buildings that impress with the beauty of their ornaments and decoration. There are places in Uzbekistan where samples of pre-Islamic culture can be found or the influence of ancient religion reflected in works of masters of Islamic period. 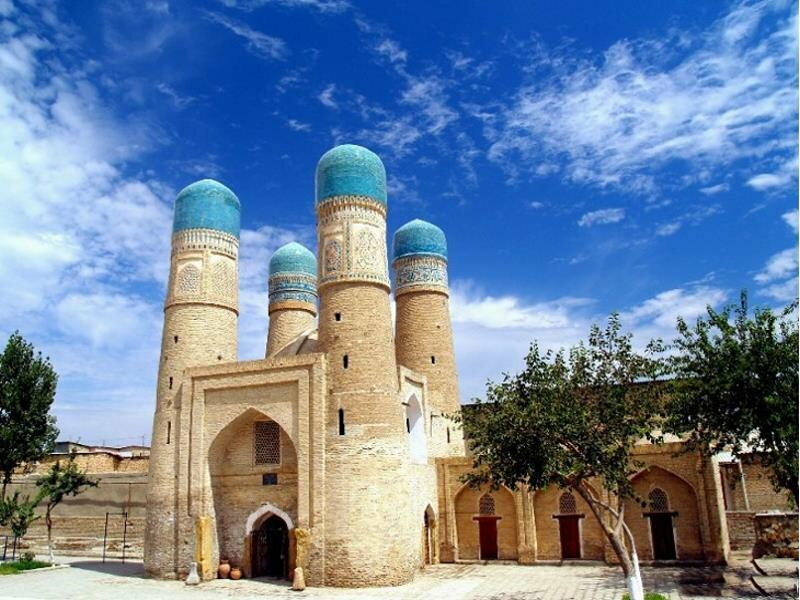 Visits to architectural monuments are included into historical tours along the Great Silk Road. Central Asian music culture is described in works of such scientists as ibn Sino (Avicenna), Horezmi, Jami, Farabi, who paid great attention to the best pieces of national music art. Our tours include stories about musical instruments and attendance of national music concerts. Uzbekistan ceramics can be discussed forever. Slip and dry ceramics are the two mostly widespread types of ceramics in Uzbekistan. Each region of the country famous with its potters has kept unique features characteristic of only this particular school. The ornament on clay ware makes it possible to define the region of Uzbekistan where it comes from and in some cases even define the author. Main centers of ceramic are located in Rishtan, Gijduvan, and Khoresm. Gumar, Samarkand, and Tashkent also have their unique patterns in pottery making and decorating. We invite you to master ceramics in workshops of real artists and to create your own pieces of art! We offer much more other master classes: pumpkin and skin painting in Samarkand; puppets making in Bukhara; you will try yourself in coining and making knives – many masters have ancient materials and toolware that they got from their professional ancestors in the workshop. You will see how handmade silk carpets are produced. 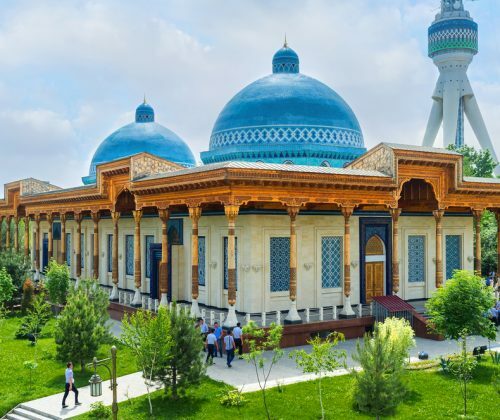 Cultural variety is represented in many museums among which there are world famous Savitskiy Museum in city of Nukus, Arts Museum in Tashkent, Termez Archeological Museum. Each architectural monument is a distinctive museum, and there is whole fortress city – Ishan Kala where nothing has changed for many centuries. Uzbekistan, with its mixture of desert regions, steppes and river valleys, is the heart of unique historical complex of nomad cultures and oasis settlements. It vividly reflects the history of Central Asia. Two thirds of Uzbekistan territory is covered with steppes and desert plains that smoothly grow into foothills owing to mountain chains of Tien Shan and Gissaro-Alay on the east and south east picks of which, at the borders with Kyrgyzstan and Tajikistan, reach 4.500 meters over the sea level. According to the statistics, 300 days a year the sun gives its warmth and light and annual precipitation level is 300 mm. It is particularly pleasant to travel here during the periods from early spring till early June, when the desert is covered with various greenery, and from September till early November. Burning summer heat is accompanied with low level of humidity, relatively cool evenings and abundance of fruits on markets while winter is dry and sunny. Winter is a skiing season. Air temperature at mountains reaches +18 ˚C but the blanket of snow remains hard and cool. There is wide range of ski runs, slalom and downhill runs and the maximum point is 4,100 meters over the sea level. Extreme lovers get there with MI-8 helicopter, no more that 18 people aboard. Five rides can be done in one day. Cable-rope takes riders to the point of 2,500 meters over the sea level. Dominating height of the Bolshoy Chimgan Mountain (“Grand Chimgan”) is 3,309 meters. View of resort area is opened from there as well as Ugam, Pskem, and Maydantal mountain ranges. At root of a mountain there is a resort area called “Chimgan Oromgokhi”, one of the favourite places among travelers. The resort area consists of hotels, cottages, cafes, and offers a wide range of services in sphere of organization of winter rest and meets various needs of the travelers. The most interesting and colorful traditions accompany Uzbek weddings. We will invite you to a real wedding in Bukhara, Samarkand or Khorezm, and you will reveal the meaning of many wonderful ceremonies and dance language which is essential for all national celebrations. Today, Uzbekistan national dance exists in two forms: traditional classical dance and people’s (folk) dance. Classical dance is famous with Fergana School (“Katga Uyni”), Bukhara School (“Makoma dance”), and Khorezm School (“Ufori makoma”). National dance is very diverse. These are cheerful, lyric, drama dances with their regional peculiarities and plastic, always telling an epic story. Traditional craft is embroidery. The center of gold-embroidery art is in Bukhara. Robes and skull-caps of gold-embroidery made in this region are famous all over the world. The tomb of Saint Daniel in Samarkand is covered with a huge velvet coverlet decorated with surahs from the Koran and it was made by Bukhara masters. Luxury of ornaments is astonishing! Suzani is traditional every-day embroidery. Usually, there are coverlets or table clothes from natural materials, usually cotton one, embroidered manually or on a sewing machine. Suzani are created using old sketches thus preserve ancient traditions. One of the oldest and famous productions in Uzbekistan is silk and wool carpets one. Majority of the carpets are hand mane and produced on ancient equipment without automation and following many-centuries technology and traditions. In order to produce one silk carpet of average size, several masters work for months. Carpet weaving centers keep sketches of old national ornamentы with special care. These pictures preserve Central Asian symbolism. Samarkand and Margilan silk factories are known all over the world. You will see the whole process from the beginning till the ready-made product. Another tradition which we offer our guest to be inspired with is Bukhara bath. Bath in the East is not just a cleanness of the body; it is purity of the soul. This ceremony cleans not only the body but the thoughts as well. In Bukhara there is a bath built in 14th century – Bozori Kord Khamam. It is a good and spatial bath inside but unsightly from the outside. Step over the threshold of an oriental bath leaving all day bustle beside. It is not only national. It is universal. You will see colorful national game of Kupkari, a traditional horse competition from the ancient times. The literal translation of the word is “body of a goat”, specially prepared ulak, a capture of the bravest and most adroit rider. Usually this game has been arranged at Navruz time, sunnat-toy, marriage or circumcision, in honor of birth of the crown prince, and it has always been exciting and august spectacle. Feel as Middle Ages nomad in travel on horses, donkeys, or camels. So that to get back to a traditional yurt of a nomad from a tour and touch the story of our people. Traditional national Uzbekistan cuisine is popular and respected by the gourmets all over the world. Just as in many other cultures, there is three-times meal in Uzbekistan: breakfast – nonushta, lunch – tushlik ovkat, and dinner – kechki ovkat. Nonushta literally means “break the flat bread” or “eat flat bread”. Ancient tradition of respect to bread remained. Flat bread cannot be put upside down on the table. That’s impossible to throw bread on the ground. Usually, dried bread is gathered and given to neighbors who have cattle or pets. Uzbekistan people like to visit each other and to bring flat bread with beautiful ornament on it. Some types of flat bread are made with onion or meat inside, others are covered with sesame or kalonja. Central Asia is famous for great variety of sour milk products. The most well-known are katyk which is made from sour milk and suzma, thick baked milk similar to the curds. Traditional palov has numerous regional diversity and peculiarities. There is a characteristic traditional dish in every Uzbekistan region. Local principle is applied almost to all Uzbekistan cuisine. For example, somsa, a pasty with meat, potato, or pumpkin and puff pastry, differs in its size and shape. And, of course, famous shahlik, taste and recipes of which differ in each region of Uzbekistan. Modern Uzbekistan cuisine follows its many-centuries traditions yet is inclined to be more dietary one taking the features of modern organism into account. Moreover, it is always in search of new tastes that makes modern Uzbekistan culinary art famous far beyond the county borders. Tea as a ceremony is one of the most wonderful oriental traditions. First, tea is offered to a guest. There is additional set of rules as well including preparation, service and drinking tea. Tea ceremony in Uzbekistan usually includes service of such dishes as somsa, flat bread, halva, dried fruits and various fried and baked dishes. During the journey you will taste famous and familiar dishes as well as rare ones that are common only for a small part in Uzbekistan. Of course, we will tell you the history of each dish. You will taste three groups of wines: table wine, heady wine, and sweet wine. Each group is subdivided into brands (aging not less than 2 years) and ordinary ones. After traditional excursion around the museum, all guests are offered 10 traditional glasses of wine in increasing manner – from soft wine to the balm. 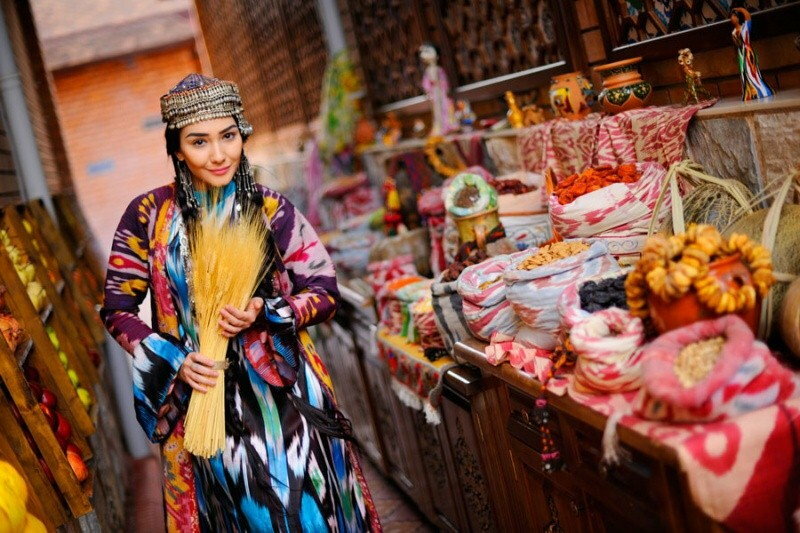 Just like many centuries ago, oriental bazaars are full of people, goods, crush, bustle and peculiar bazaar spirit – the Spirit of Trade which has been flourishing since the times of the Great Silk Road. There is a famous bazaar in each town and equally famous specialized bazaars around towns. Many of them are several centuries old. In their core, these are just places, crossroads where people have been gathering and selling and buying things for centuries. There are birds and cattle bazaars, carpets bazaars, hats bazaars, jewelry bazaars and even knives or horses bazaars. It is great pleasure to walk along Fergana bazaars. Cheerful and kind Fergana people invite customers to come to their counters, and they want less to sell than to talk. “If you do not want to buy, come and taste it at least.” They have their pictures taken with great pleasure and if you ask them a question about goods, you will hear the whole story. Indeed, have you got a thorough knowledge about rice? And they do know everything about rice. What about Chust? Provincial and nice Chust where one of the oldest bazaars is found, skull-caps one (“tyubeteyka”). It takes one week for a master-hand to make one skull-cap. Then it is given to Chust bazaar, a crossroad in front of the makhalla, where at bazaar day – only one in a week – there is no room to swing a cat. Customers from all over Uzbekistan come to this bazaar to buy authentic Chust skull-cap which is either worn only on holidays or is given as a present. Siab bazaar in Samarkand is a world of sweets. Noisy, smiling Siab, huge, stretched far beyond its boarders, in the shade of ancient monuments, invites you to taste, talk, make jokes with sellers. Here, you can drink mulberry juice which has just been made before you very eyes – tart, thick-vinous, coloring your hands and tongue crimson. What about Tashkent? After so many years, it is impossible to tell for sure who and when has started to use spices in the East. As you know, water seasoned with bay leaf and cumin can be considered as a soup, and if you add some millet there, it will already be a royal dinner… And the very poor man in the East could boast of seasoning food with expensive spices just as the richest people in Europe. Majority of spices came to our land from South East Asia where from caravans were moving along the Great Silk Road, with bags full of pepper which was getting more and more expensive with each parasang and by the time of arrival to the place of destination, it cost as a whole bag of jewels. Spices can be bought at any bazaar in Tashkent but the widest products range is at Eski Juva, Chorsu. Countless counters with spices from different regions of Uzbekistan, India, China, UAE are found under a huge dome building on the second floor. Everything can be found here – possibly, there is hardly a spice which is not there. Even if it is not available at the moment, it will be found and brought especially for you. It is a great pleasure to walk across the bazaar and look at colorful hills with various smell, ask their names, listen to stories about spices and, of course, buy them measured by tiny shots in small paper-bags, a bit of every spice. So that when you are back home from the trip, you open this little paper-bag with jeera, smell it and remember Uzbekistan. Every bazaar has its peculiarity and a product which cannot be bought anywhere else. Either you buy it overpaying or buy a wrong thing. Hats and wool socks are better to be bought in Khiva. Gold and jewelry – in Bukhara. In Samarkand – dried fruits, flat cakes, sweets. In Fergana Valley – ceramics, knives, silk. In Tashkent – spices. You can find souvenirs everywhere. It is important to remember not to buy ancient things as the customs will not let them pass. When you buy a carpet, special document should be completed at a factory. Bazaar is the heart of the East. Our group is back from Uzbekistan and Georgia safe and very satisfied of their trip! My guide’s report is very positive about the services you have presented ; very nice and typical hotels, punctual and clean service of transport, a very kind and professional guide,…warm people and very nice restaurants! They have enjoyed every detail featured on the program and they have very much appreciated the services of Mr. Shermat, who was so kind, professional and cooperative. Please transfer our big thanks to him. Finally, I wish to renew our thanks to Dolores for your professional organization of the trip, for your kindness and for your support! We will definitely think about another trip to your country in the future! My parents and I got back from our trip on Monday and are catching up on sleep and adjusting to the time change. Thanks to your careful planning, our stay in Uzbekistan was most rewarding and enjoyable. Our accommodations in Tashkent, Bukhara, and Samarkand were very good, and the sights, sounds, and flavors of Uzbekistan were as memorable as we'd hoped. But what made our journey exceptional was the quality of our guides Tatyana, Dilya, and Suzanna and the exact scheduling of all our transportation commitments. Every rendez vous worked exactly as planned. Thank you for your guidance throughout our itinerary. We won't hesitate to recommend Dolores to our adventurous friends! The main reason why I wanted to come to Uzbekistan was Samarkand! I take much interest in Oriental architecture. But when I came to Uzbekistan, I, of course, couldn’t help visiting Bukhara and Khiva. And I so much liked Khiva! It is my belief that Samarkand with its outstanding monuments of architecture is one of the most beautiful and amazing cities in the world. I’ve had the desire to visit Samarkand since I saw the photographs of my colleagues who had already travelled there. Those ancient names of architectural ensembles sounded to me like fairy tales! I feel so peacefulhere, much more peaceful than in my country:-)… You can tell this to the King of my country, to the Minister and all the other officials! Hello, Dolores team! We arrived safely and had a great trip. The organization was great and accurate. Hotels were good (Malika Kheyvak was very good and friendly, Kukaldosh had good rooms). Guides were good (Nilufar Nuriddinova in Bukhara was excellent), Drivers were very good. So as you can see we had a good experience. I made up my mind to spend my vacation in Uzbekistan. I’ve always wanted to see Central Azia which I knew about from many publications describing this country. But, after all, my decision to go was spontaneous and I do not regret this! I feel relaxed here. The people are open-hearted, hospitable and smiling. They are so easy to communicate with; they treat me so respectfully and friendly!